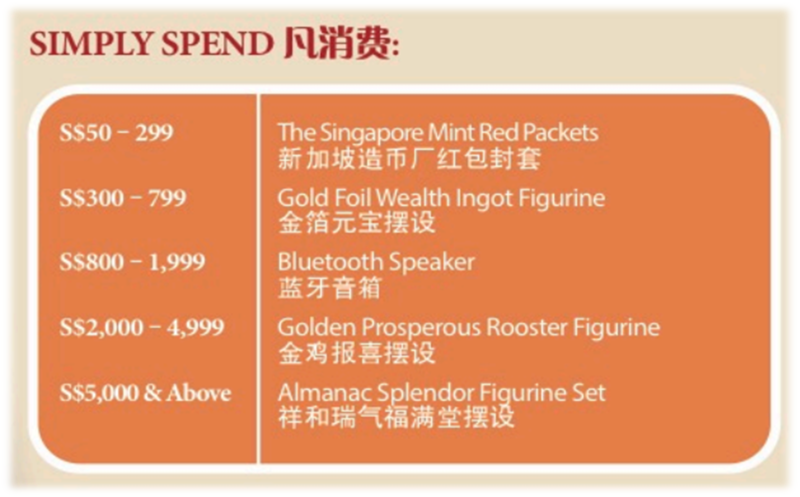 The Singapore Mint 2017 Lunar Fair is back with its highly anticipated products, goodies and activities to commemorate the Year of the Rooster. Join us in celebration and bring home with you some of the valuable commemorative coins and trinkets. Rack up at least S$50 in a single receipt to redeem fabulous gifts. Be spoilt for choice with the vast range of goodies available. Kick start the lunar festivities and join us as we add a touch of fun to Chinese traditions. Join in our fun-filled activities (with min spending of S$100), and receive meaningful festive goodies. Meet and greet with God of Fortune, as he visits daily to bring you good luck and fortune for the new year! Join Tong Tong and family in this book which celebrates the main Chinese festivals! “Time to Celebrate!” book is free** with a minimum purchase of S$500. Find out more about the picture book here! Free Coin Deposit Service available at The Singapore Mint Lunar Fair @ HDB Hub, limited to first 1000 pieces of circulation coins. Spread love and joy with every purchase of our Charity Coin Pack. Each pack is a kilogram worth of foreign coins from around the world. All proceeds from the sale will go directly to charity. *Terms and conditions apply. Above highlights, promotions and activities are exclusive to the Lunar Fair event from 1 to 10 January 2017 only.